Hey guys! 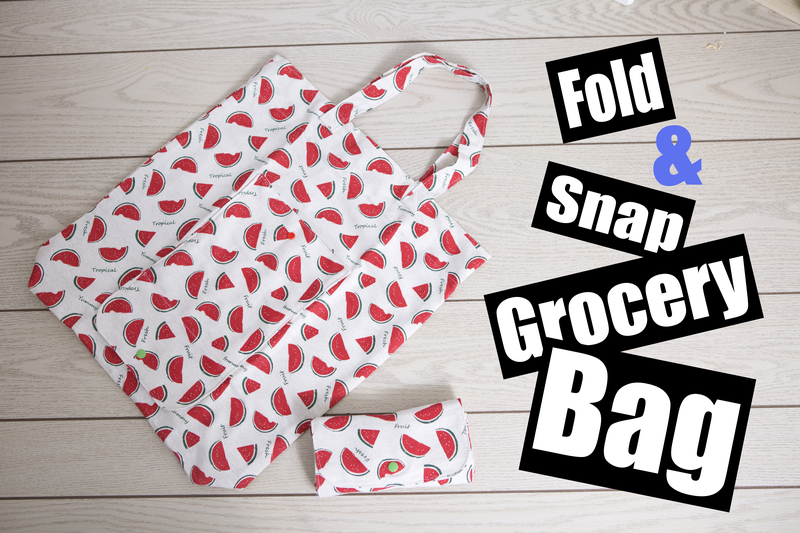 welcome to my Fold and Snap grocery bag tutorial! here you will find the measurements, materials , photos and link to the full video tutorial. Step 1 – Put the two flap pocket pieces together, right sides together. sew all the way around leaving a 3″ gap on the side of it. Step 2 – snip the rounded corners and the corns off. turn the piece right sides out. Step 3 – Iron your piece flat, turn the raw edges in at the hole. step 4 – mark a line 3 1/2″ away from the round side (which would be your Flap side) This line will be the bottom of the pocket. Now sew along the short flat side(top of the pocket), and the curved flap side, dont sew past the line we marked. **For this bag i am choosing to do French seams, this will help to hide the raw edges since this is a 1 layer bag. if you want you can choose not to do french seams and use a serger to finish your edges. Step 7 – place pocket flap centre on one side of the bag, measure 3″ away from the bottom, make sure the flap part is near the bottom of the bag as shown. Sew down the one side to the marked line, sew across on the line we marked earlier and back up the other side of pocket. this will create your pocket and leave the flap free. Step 8 – Create straps, fold in short sides by 1/4″ press and then fold in the sides 1/4″ and press, Fold entire thing in half and press to create strap, Sew all the way around the strap to secure down the sides. Step 9 – fold down the top of the bag so the top of the bag is 6″ away from the top of the pocket. Step 10 – Fold up the raw edge to hem the raw edge. Sew all the way around to secure down the hem and sew along the top of the bag 1/8″ away from the fold. Step 11 – attach straps, you can attach them on the outside or the inside, over lap strap about 1″ and sew a box with an X to secure it to the bag. Attach male end of snap to the flap, fold up the bag and find the placement for the second snap, it will fall onto the top of the pocket make sure you only put the snap on the pocket and it doesnt go through to the actual bag.